Announcement Matana Jewelry creates timeless, high quality jewelry like earrings, bracelets and necklaces that are handcrafted with intricate detail. Using quality metals, semi precious stones, high end gold coatings, Vermeil and silver. Every piece is unique, authentic and brilliantly designed to give you fashionable and trendy jewelry you can't find anywhere else. 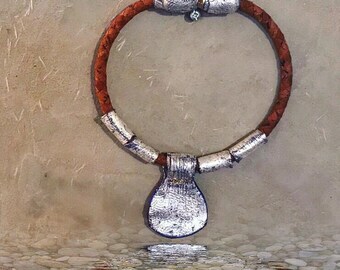 I offer a variety of sizes, styles and colors that are perfect for rustic, bohemian, modern and traditional lifestyles. My ancient inspired wearable pieces are truly in a league of their own and offer a timeless piece that is suitable for all styles. If ever you do not see what you are looking for, please reach out to me. 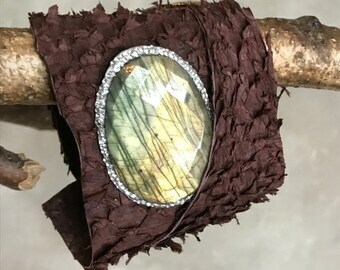 I would be happy to work with you on a custom order and bring your vision to life in a perfect, wearable jewelry piece that adds to your collection. Matana Jewelry creates timeless, high quality jewelry like earrings, bracelets and necklaces that are handcrafted with intricate detail. Using quality metals, semi precious stones, high end gold coatings, Vermeil and silver. Every piece is unique, authentic and brilliantly designed to give you fashionable and trendy jewelry you can't find anywhere else. Rustic delicate Gold earrings with circles. Well done. Creative. Unusual. Fun. The earrings are beautiful. The only thing I'm having a bit of a hard time is with the clasp. It challenging to get on. Matana created this perfect set of feather earrings for me, to match a gown I was going to wear to sing a recital about birds. It was absolutely PERFECT. Stunningly delicate yet able to be seen and enjoyed by my audience, and much admired during the post-concert reception. Thank you for such a unique set of earrings! Ancient find series - Chalcedony ring pave with Swarovski crystals and 24 k gold. 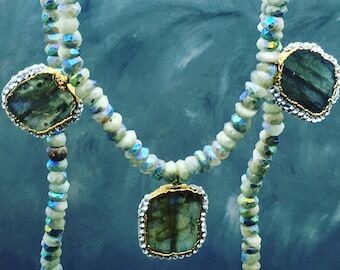 Matana Jewelry is based in New Jersey and specializes in unique handmade Jewelry made with semi precious stones, precious and semi precocious metals. My inspiration comes from nature and both ancient, antique and contemporary jewelry and styles. I bring this inspiration to life using a variety of materials like gemstones, diamonds, crystals, gold, silver, vermeil, silk, leather and most anything that inspires me to make the heart expand with joy of beauty. Some of my work has a Mediterranean feel to it, inspired by the colors and forms of ancient Mediterranean jewelry. I love the organic free-form and rustic shapes and textures that matches my love of a free spirit and personality. My jewelry collections speak to a wide variety of women of different ages. My passion is to create jewelry that is empowering for women and make them feel confident, beautiful and unique with a clear vision and a sense of style. I create jewelry that is both casual and dressy and simple and sophisticated. I am very passionate about my work. I invest a lot of time, effort and love to every piece you see in my shop. My mission is for everyone to be able to find their unique piece of jewelry that they will personally relate to and love. I want my work to spread joy and inspire beauty all around. So often my customers reach out to me with their love and gratitude for the special piece of jewelry they purchased. I love to hear my customers tell me how happy they are wearing my pieces and I can see their eyes sparkle when they tell me about the complements they receive while wearing my Jewelry. It gives me a great deal of pleasure to hear that because this is why I create the jewelry I do. My work sells in upscale Juried art shows around the US, as well as Charity boutiques. I love to do those charity events as they have an important cause of supporting communities in need. I also sell in some art galleries and have a very active Facebook Fan page. Thank you for taking the time to get to know me, my work and browsing my shop. I do hope that you love my pieces as much as I love creating them for you. Jewelry designer and mixed media artist. Painter and felt artist since 1999. Patricia is helping me in my studio with my production. She is Colombian with a background in Architecture. She is my right hand in my studio and have been a great help since 2013. I love using a US based co. for some of my productions. A NY based company is helping producing some of the elements I design and combine in my pieces. I hand curve the pieces and that cast them to form some unique elements. We use one of thee BEST companies in the US for the high end 24k gold coating for my elemnsts. 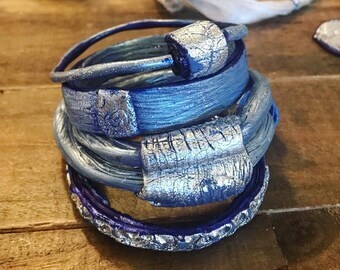 Here you will find handmade Jewelry Elegant ,Bohemian, rustic, hand curved or ancient inspired, all may be combined in order to form and create simple yet beautiful and unique jewelry. I work and create in my NJ located studio. Feel free to message me if you have any questions or comments. I'd like my customers to be happy with their purchase! If for some reason you are not entirely satisfied, please notify me within 48 hours of receiving it ,I would gladly refund or exchange the item.All I ask is that you please contact me first thing and I will do my best to accommodate your request. The item must be sent back in it's original packaging condition. Refunds will be processed within two days after I've received the item in its original condition. Please note that custom orders are not eligible for refund. We will gladly ship you items as soon as your payment is cleared.If you need any help processing your PayPal payment,please do not hesitate to ask for assistance and I'll do my best to help you. At the moment I offer a free insured shipping with no extra charge. We beautifully gift wrap and ship the jewelry in a safe way using a bubble wrap envelop or boxes for extra protection. If you have any special requests in regards,you can send me a message. Once your payment is received, in stock items will be shipped within 1-3 days and special custom orders approximately 1 to 3 weeks for most orders, Some orders may take up to 6 weeks is rare occasion, Pleas convo me if you have an urgent custom order and wish to expedite it, I will do my best if I can accommodate your request. I ship to the address listed in your Etsy transaction, unless you tell me otherwise. Please verify the address for shipping is matching the Etsy address. We use USPS first class mail, if you need an expedited shipping please let me know and I will check shipping cost according to location and get back to you with the details. Orders usually shipped via USPS first class ,mail within the US usually take 3-7 days to arrive,depending on your location. International orders are shipped via USPS first class international air mail and can take 2-4 weeks to arrive. (sometimes,due to customs and restrictions it may take up to 6 weeks,but it's not usual). If you need your item earlier I can send you a quote for a faster delivery according to your request. Depending on your country's customs regulation,their might be some custom charges. I do take custom orders so send me a message if you are looking for something special. I'm also able to change sizes,length of color of some of the pieces I make. Due to a special production process,orders of bangles and rings may take longer than usual,and 6 - 7weeks. Also no two are the same,so if you wish to order the rustic style rings or bangles please note that shape may slightly vary due to hand curving crafting process. Some of my pieces may be converted to Gold and Diamonds,so please convo me if you wish to place a special order. I welcome wholesale inquiries ,so please contact me with any request. I strive to make jewelry and accessories that are built for everyday wear as well as special occasion,and will last a lifetime when lovingly looked after. Jewelry requires delicate handling and adequate storage. In order to make sure your jewelry is well reserved it is recommended to clean it with a soft dry cloth after wearing it and keep it away from moist. If Your favorite piece is in need of repair I will happily fix it for you free of charge.